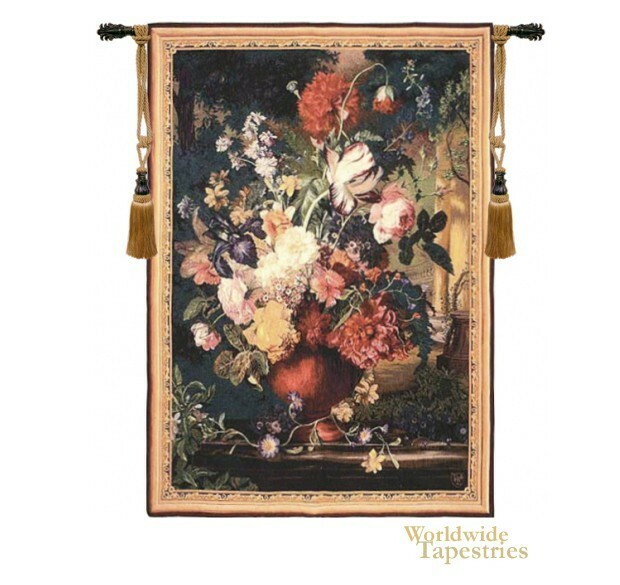 Bouquet Flamand tapestry shows a bouquet of flowers based on the original Gobelins tapestry art from the 18th century. Full of detail and artistry, we see in this Flemish bouquet tapestry, flowers including roses, peonies and striped tulips, a showcase of flowers in all their beauty. Also seen are some smaller flowers are also falling onto the ledge below as if the work has captured these flowers in a moment in time. The Gobelins tapestry manufactory in France produced wonderful works and here we have a work inspired by the traditions and beauty of the tapestries from this era of French history. This wonderful floral tapestry "Bouquet Flamand" is backed with a lining and has a tunnel for easy hanging. Note: tapestry rod, tassels and accessories, where pictured, are not included in the price.